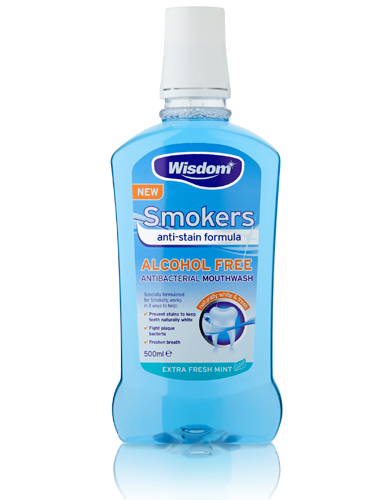 Wisdom Smokers mouthwash has been specially formulated for Smokers. Its Anti-Stain formula helps prevent stain build up, whilst its antibacterial formulation helps fight plaque bacteria and freshen breath. Use after flossing and brushing to complete your oral care regime. Use with the Smokers brush and toothpaste to keep your teeth naturally white. Ingredients: Aqua, Sorbitol, PEG-40 Hydrogenated Castor Oil, Aroma, Citric Acid, Sodium Benzoate, Sodium Citrate, Zinc Chloride, Sodium Phosphate, Sodium Saccharin, Cetylpyridinium Chloride, Sodium Fluoride, Sodium Hydroxide, Phosphoric Acid, Cl 42051. DO NOT SWALLOW. Keep out of reach of children. Not suitable for use by children under 6 years of age. Wisdom Smokers toothpaste has been specially formulated for Smokers….